Avante Audio’s Imperio Series is a modular “mini” line array system suited to small-to-mid-sized venues and production companies looking for a flexible active speaker system that can be deployed in various configurations to suit a wide variety of different applications. 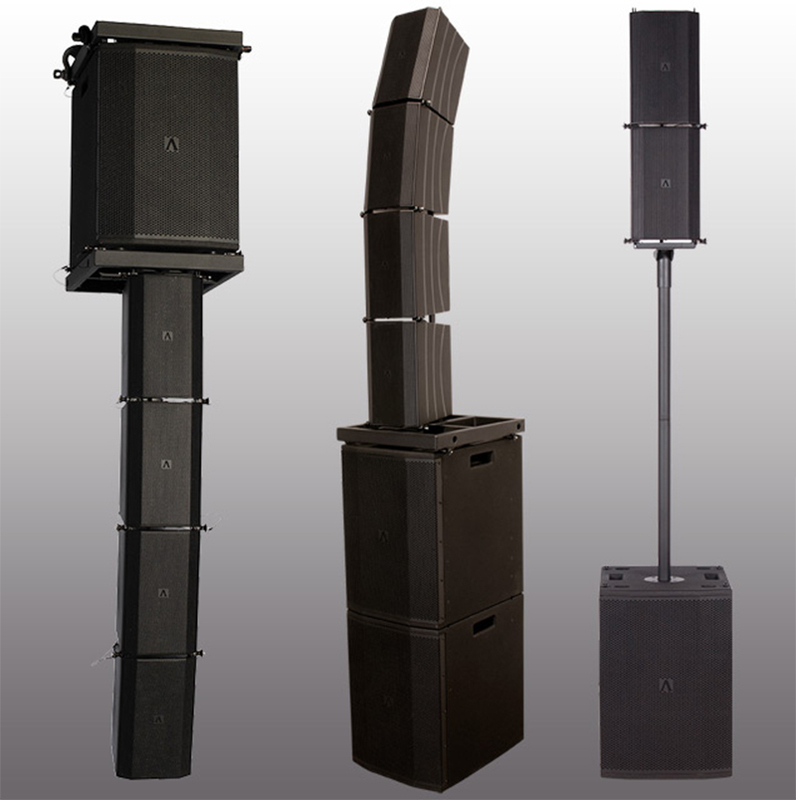 The Imperio system consists of three active speaker cabinets alongside a range of accessories and a variety of hardware that allows for both flying and ground-stacking. The Imperio is a versatile array module loaded with a pair of small woofers alongside six high frequency drivers, the Imperio Sub is a powerful sub bass enclosure featuring a single woofer and a built-in crossover and the Imperio SUB210 is a dual woofer model that can be deployed either vertically or horizontally. All three feature internal Class D amplification and can be used together in multiple combinations to build systems suitable for a wide range of different purposes. Designed to offer the ultimate combination of audio clarity, portability and flexibility, the Imperio features two 4.75” Neodymium woofers each with a 1-inch voice coil. These are paired with an array of six 1.75” IDVAT (Inverted Dome Vertical Array Technology) HF drivers to deliver a wide frequency response of 150Hz – 20KHz and an impressive maximum output SPL of 117dB (single box measured on Axis @ 1m). The unit’s internal Class D 2-way amplifier is rated at 240W (RMS) and features 24-bit DSP with a number of easily selectable configuration settings. There is also an Input Sensitivity Dial as well as LED indicators for Power and Signal/Clip. Both XLR audio and powerCON power input and output sockets are provided, allowing for easy connection between multiple units within an array setup. Boasting a robust ABS plastic construction, finished with a heavy duty 1.0mm steel grille, the Imperio has a sleek and distinctive design. Despite packing a serious audio punch and being built for a life on the road, the cabinet is compact – 7.3″ x 8.8″ x 12.8″ / 184.8 x 224 x 324mm – and extremely lightweight – 14 lbs. / 6.3 kg. With a narrow dispersion angle of 90-degrees x 15-degrees, the cabinet is designed to be deployed in a vertical array configuration. It is fitted with in-built rigging hardware that allows up to eight units to be linked together with selectable splay angles of 0, 4, 8 or 12-degrees between cabinets. Using the optional flying kits the sub units can then be mounted either above or below the hang, while a pole mount kit is also available for ground-stacked setups. The matching Imperio Sub has been rigorously designed and tested to perfectly match the Imperio, providing enhanced low frequency reproduction. It features a 10” woofer with a 2.5” voice coil and a 6th Order Bandpass design, allowing for a punchy maximum SPL of 123dB. A powerful Class D amplifier delivers 400 watts RMS (800 watts peak) to the driver and the internal crossover can be set to 90Hz or 120Hz. The unit is also phase switchable (0/180) and features a volume control dial as well as status LEDs for Power and Signal/Clip. As with the Imperio model, the sub features XLR and powerCON inputs and outputs to allow daisy-chaining of signal and power connection for quick and easy setup. Housed in a solid plywood cabinet with a sleek black finish, the Imperio Sub’s speaker cone is protected by a thick 1.2mm steel grille. It is fitted with convenient handles on either side as well as an M20 screw pole mount socket. With relatively small dimensions of 13.8” x 18.3” x 20.7” / 300mm x 465mm x 526mm (L x D x H) and a manageable weight of 49.6 lbs. / 22.5kgs., it is equally suited to temporary event production as it is to permanent venue installation. For larger venues or applications that require increased bass, the Imperio SUB210 offers a dual 10” woofer configuration each with a 2.5” voice coil. Powered by a Class D digital amplifier delivering 700 watts RMS (1400 watts peak), this model also features a 6th Order Bandpass design and offers an increased maximum SPL of 124dB. As with the other sub model, the Imperio SUB210 features an internal crossover that can be switched to 90Hz or 120Hz and is also phase switchable (0/180). It is fitted with XLR and powerCON inputs and outputs together with a volume control dial and status LEDs for Power and Signal/Clip. Featuring a flexible design that allows it to be used vertically or horizontally, the robust plywood cabinet is fitted with two M20 Screw Pole Mounts. In addition to the standard black finish, all of the Imperio Series speaker cabinets and rigging accessories are also available in white. Ideal for houses of worship and any other venue with a white or light color scheme, the white Imperio models feature both white cabinets and white grilles for a distinctively different look. Offering a unique combination of excellent audio quality and flexibility, the Imperio Series sits between full-size array systems and the traditional point-source cabinets used for installation in small-to-mid-size venues. It is ideal for use in churches, concert venues, nightclubs and theatres looking for a professional, reliable and adaptable high-quality audio solution.